Not much music in the window. They filled it with a display for Oasis' Don't Look Back in Anger single in 1995. Those days are gone. 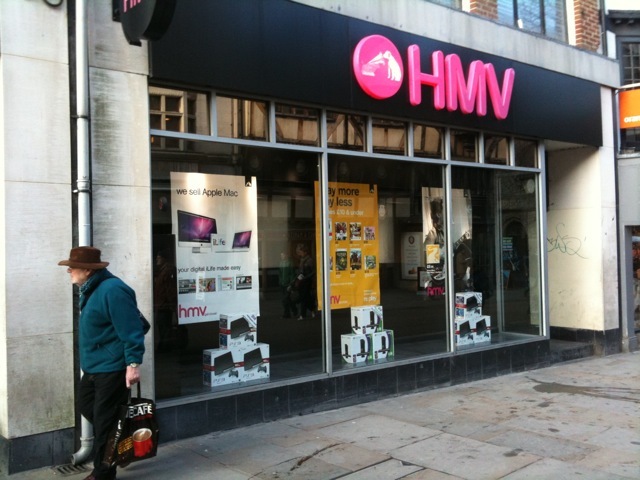 HMV is the last recorded music retail outlet left in the UK high street. Over the past few years we’ve seen the demise of Our Price, Woolworths and Virgin Megastore/Zavii. Now, for the very same reason HMV are closing around 60 stores. People usually blame the demise of our record shops on technology and the rise of iTunes and Amazon. But I believe there’s a deeper reason why the high street shops have failed. The fact that it’s more convenient to buy music online is a misnomer. We’ve all fallen into the trap thinking that ‘convenience’, speed and price are the only factors involved in a purchase. That is of course true with a commodity. With a purchase that is not a simple commodity, price has little baring because its the buying experience and the added value that is important. This is how the music industry has played the biggest part in it’s own death, by stupidly turning music into a base commodity. The rot started in the mid 1980s when the music industry began the great compact disc swindle. They persuaded us to buy all the music we already had on vinyl, citing the better quality (which wasn’t quite true) and the better durability (which wasn’t quite true) and the fact that the new medium was smaller and therefore more, ‘convenient’. Because it was smaller we lost the experience of the album cover art. Because CD singles and albums were the same size we lost the specialness of both mediums. Because it was so handy and cheap it was quickly devalued and able to be given away free with magazines. The digital nature of the encoded audio and availability of CD burners meant it became easy to duplicate. By removing all the awkwardness and weaknesses of the vinyl record, they had transformed recorded music into a cheap, valueless commodity. 12” long playing records or a three minute 45 rpm single are completely different objects to the equivalent CD. They are bigger, heavier, have bigger almost poster-like artwork. They are fragile. To play a vinyl record you have to remove it carefully from the sleeve, place it on the spindle, lift the needle into place. After 3 or 20 minutes or so you have to lift the needle again and turn the disc over. With vinyl you are engaged and that’s the key: listening to music is an experience, not a commodity. In the mid 1980s, Our Price Records changed their name to Our Price Music because they were now stocking tapes and CDs. They somehow felt they weren’t ‘records’. A small point but a relevant one in the separation of ‘music’ from the medium it came on and at the same time from the experience. It’s interesting that new bands, even today, stubbornly refer to their product as ‘records’ not CDs. A compact disc or vinyl disc is the medium for the ‘record’, which is the important thing. At this point in an argument like this people usually cite the old chestnut of the ‘march of progress’ and the ‘advancement of technology’ and that we shouldn’t live in the past but embrace the future. This is rubbish. If technology was more important than experience we would not have restaurants or cooking, we’d just take a variety of nutrition pills. We would not have clothes fashion, we’d all wear silver fabric jumpsuits. The experience is important and that’s what we cling onto. That’s what we pay for. That’s why cinema attendance has never been so high even though it’s more convenient to watch DVDs at home on your 40” TV. That’s why music concert and festival attendance has never been so high when we can all put our iPod headphones on an listen to whatever we want whenever and wherever we want. The irony is that the secret to the safe survival of the music industry was right there all the time, inside the music industry with the songwriters and musicians that make new music. The technology involved in recorded sound has advanced unimaginably since the early 1960s and yet all new rock bands that start making music aim to make that music using methods and technology that goes back 50 years. That’s why rock bands play guitars that may be newly manufactured, but their design and set up is a facsimile of the instruments that the Beatles, the Stones, or Led Zeppelin all played. In the 1990s VOX amplifiers brought back their old fashioned looking range of amps because all the bands wanted their stage to look like what all the classic bands stages looked like. Amplifier manufacturers ditched the advanced electronics and transistors to return to the values and tubes of the 60s because the musicians wanted that authentic value sound. And of course every rock band wants their records to be released on vinyl. Of course not all new music follows this pattern and amazing sounds and new forms of music have been created with new technology too. The point here is that the music industry failed to realise that all music is not the same. The dance halls are filed with electronica, young girls fill their iPods with the latest pre-fab teenybopper and festival goers want their bands to be live and authentic. These are just three types of music which are created and consumed in completely different ways by different types of people for different types of people. And yet HMV and the like tried to sell it all in the same way, and when that started to fail they filled their shops with DVDs, computer games and iMacs, betraying the music audience they used to serve and appealed to no-one. It’s probably too late for a single company like HMV to recover, but it’s not too late for the music industry. They need to re-discover that music is an experience. Some of those experiences can be packaged and sold at a profit and some cannot. They need to stop treating all music as the same thing. The genres are consumed in such different ways and yet the only way they’re differentiated in a music shop is by having their CDs in a different rack. High street shops have something that iTunes doesn’t have: a physical shop that you can walk into. Music shops (and bookshops) seem to moan or panic as if such an advantage is a noose around their neck. If retail was dead, how come Apple Inc. opened their hundred or so shops worldwide and get a footfall of almost two million people per day for products that is easier to buy online. The answer is that they have created an experience that you can’t get online. If the music shops realised that certain genres of music have an audience that would relish having a shop experience they could have transformed their retail units to accommodate them. By getting rid of all products that people would rather buy somewhere else they could have re-stocked vinyl records (a niche but growing market). They could have hosted classic album listening sessions. They could have hosted live bands. They could have built a model around the long-tail (selling many different obscure materials rather than stocking just few obvious titles). They should have realised that the markets these ideas would appeal to have the money and inclination to want it. It would mean abandoning the X Factors, Pop Idols and the charts (you can’t compete with the commodity of the download) and embracing an older audience. 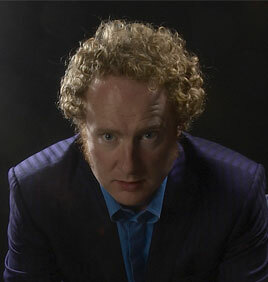 It would mean only the music genres that have the strongest experiential and lifestyle elements: possibly including new emerging urban sounds, some types of dance, classic rock, blues, jazz and folk (basically all the music forms created from the ground up by people, not manufactured to a formula by music industry management). They say you can make excuses or you can make money, you can’t do both. The problems any business faces today can’t be blamed on technology or changing markets, or government policy or the world banks. They can only be blamed on an inability to creatively change the business model to follow the money. The reason businesses can’t cope with change is that their stuck in one way of thinking with an inability to be more creative when solving business problems. That’s way those record shops have gone. It’s not because people don’t want music or don’t want a shop, but because the shops failed to supply the experience the audience wanted through stubbornness, greed, ignorance and by keeping on doing what they’ve always done and expecting different results.